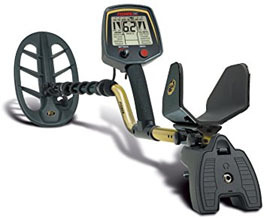 The F-75 is Ideal for coin, relics, jewelry, caches and gold nuggets. Versatility Default jewelry, bottle caps and plowed field Modes covers all bases. The F-75 has adjustable Discrimination and Notch, three different all Metal Modes. Bottom Line, Accessory Search Coils; Add after the features. Ground Penetration Ground balance manually or by using the FASTGRAB. An active on screen meter shows the relative amount of iron mineralization present for monitoring soil conditions. Noise Cancelation Minimize electromagnetis interference by reducing sensitivity or switching between seven different frequency options. Target Separetion Quickly recover between closely associated targets with a fast speed. Easily identify desired targets like coins and relics masked by other targets like nails. screen making it easy to learn and use. Has a rear-mounted jack. Battery Life 40 hours of power with one set of 4 AA Alkaline batteries. Default jewelry, bottle caps and plowed field Modes covers all bases. The F-75 has adjustable Discrimination and Notch, three different all Metal Modes.